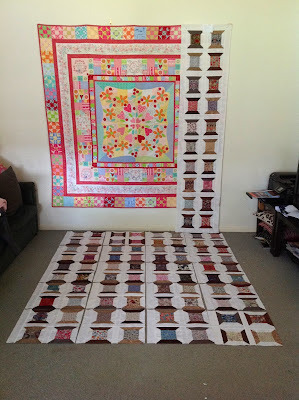 Over Saturday afternoon through to Sunday I have managed to take this pile of blocks (below) and turn them into this Quilt Top above and I am wrapped with the outcome. This is a picture (below) that I posted to Instagram at midnight Saturday. Then on Sunday this started to happen and I was loving the results so much that I just kept going. My dream of 100 different Liberty Lawn Spools has been realised. 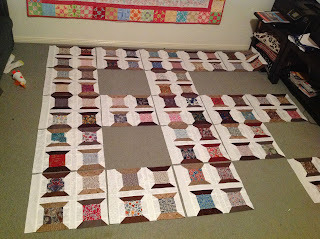 I love how the different scrappy, tone on tone whites work in this quilt. 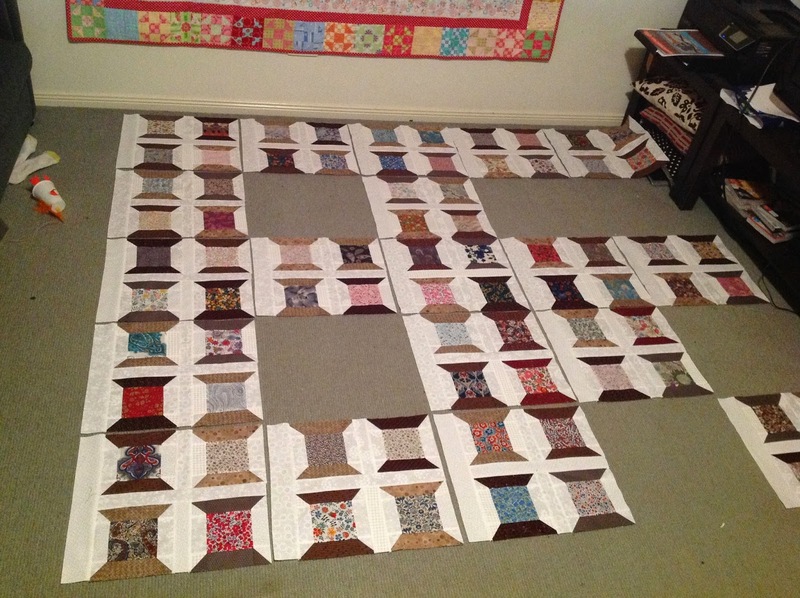 Now to find the perfect backing fabric and send her off to be quilted. Next time you see her she will be all finished, I can't wait. 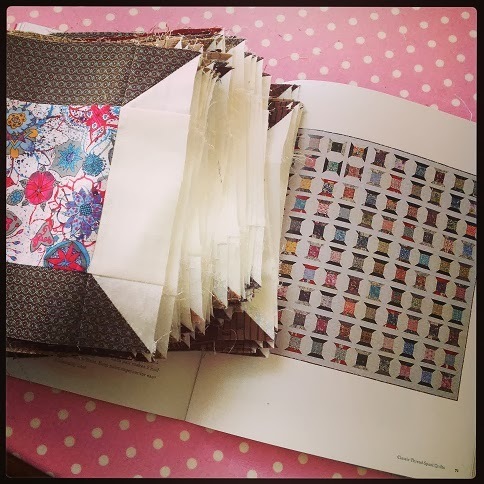 and is the second quilt I have made from this book. 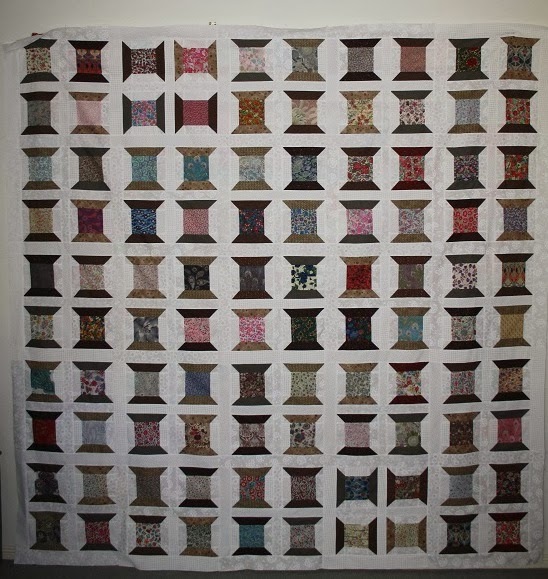 Tip - When I decided I wanted to make this quilt and that I wanted 100 different Liberty prints for my spools I though that this meant I would have a long lead time and a huge expense as I "stashed the fabrics" to make this happen. 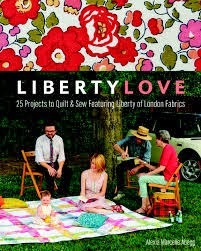 If your familiar with Liberty Lawn fabrics then you know that FQ's can start around $12 and sky rocket upwards. I would suggest that you "stalk" ebay :o) I was lucky enough to find some "scrap packs". It was a little bit of a risk but one that payed off big time. My biggest find was from a seller in the UK. 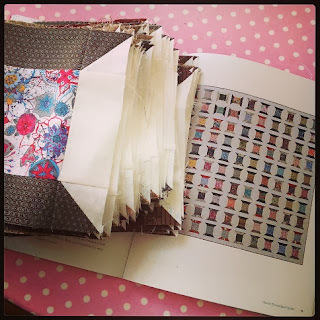 She had her packs listed in colour groups and with no duplicates. Happy hunting. Did I mention that I LOVE this top? And no wonder you just want to look at it Sharon... it's wonderful!!! SHe's beautiful!! I'd want to sit and look for awhile, too. I LOVE it too!! 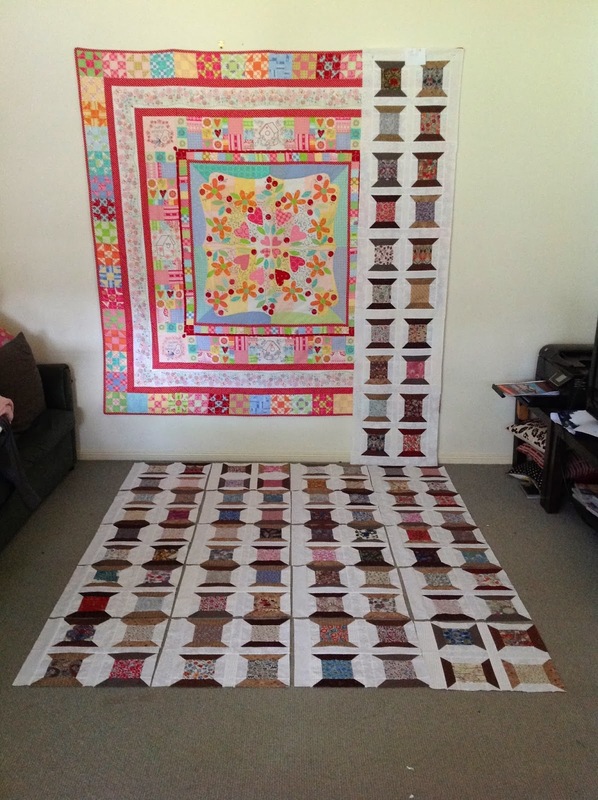 Can't wait to see how she quilts it! Your quilt is fantastic Sharon. And it's huge! I can see why you love it. I love it too! Well worth loads of admiration - it's beautiful. your top looks amazing I can understand why you are so in love with it. It's really lovely Sharon, love the muted tones. OMG. Love it. It looks stunning. It is awesome Sharon! 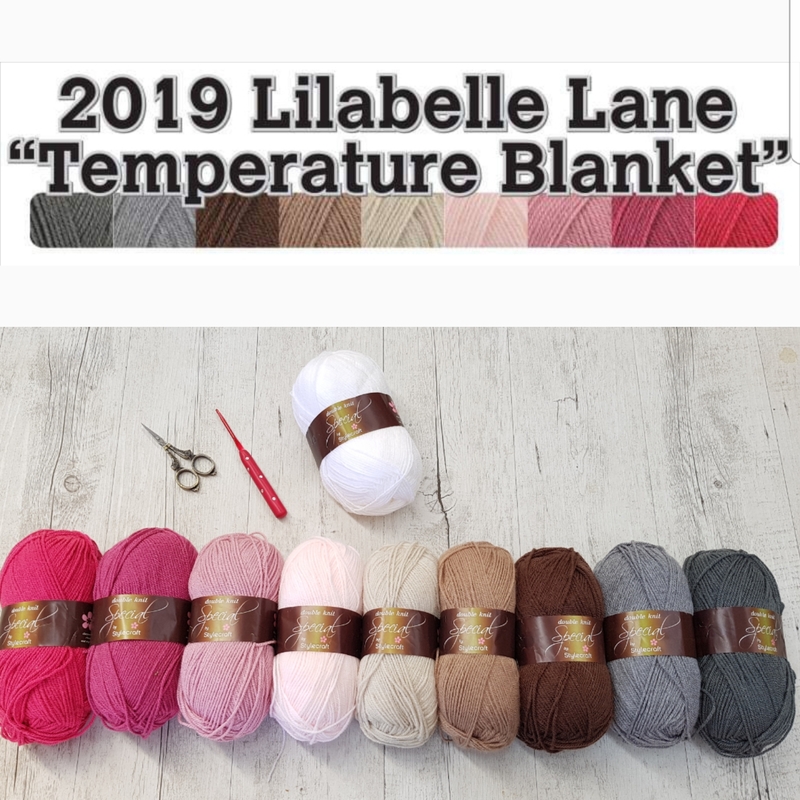 I can't wait to see it quilted! It is fabulous and I love how the white on white fabrics add to the overall design too. Fantastic Sharon I don't blame you for wanting to sit back and admire for a bit longer, well done!! :) Barb. 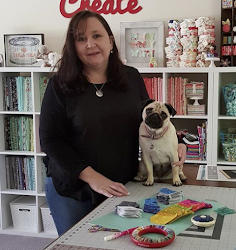 Amazing Sharon, you have done a sensational job with it! Just beautiful! Well done you!! Wow Sharon, you continue to keep my eyes happy - this is amazing! - well done - I hope you find some great backing soon, so that you can finish it & continue to be pleased!! wow Sharon, it looks wonderful. Will we see it at Mill Rosie Friends meet next weekend?